We specialise in authentic, traditional French crêpes and waffles which are prepared and cooked on demand daily. La Petite Crêperie, Swanston Street (opposite the Melbourne Town Hall) is a takeaway kiosk located on the footpath where we serve a variety of delicious sweet crêpes in an easy to eat take away cone. The kiosk was formally a newspaper stand and has been transformed into a glistening ‘exquise crêpe bâtiment’ the first of its kind in Australia, bringing a touch of Paris to the hearts of Melbourne. La Petite Crêperie, QV Square is our newly opened takeaway mobile caravan kiosk ( known as Lucile!). A ‘build it yourself’ menu allows you to get creative with some of your favourite sweet crêpe and waffle toppings. They are all made on demand and served in easy to eat packaging. You can find some cold beverages ( such as Orangina ) too. 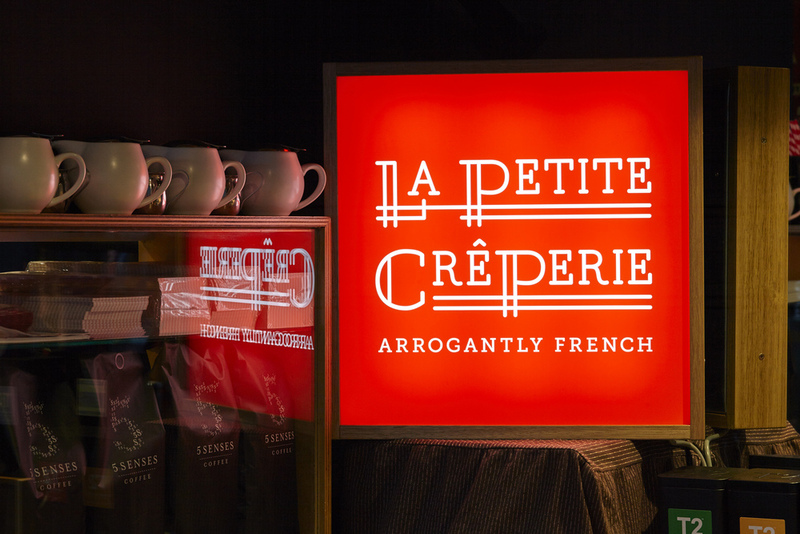 La Petite Crêperie, The Loft ( Level 3, Forest Hill Chase ) is our newest LPC takeaway kiosk ( known as Violette!) which is found indoors in the newly re developed Level 3 Forest Hill Chase entertainment precinct; The Loft. Come and see our innovative open plan design which incorporates your favourite design and branding elements from our Swanston Street and outdoor caravan kiosks. Here too you will find your favourite sweet crêpe and waffle combinations which you can build yourself and get creative! We also serve a small selection of cold beverages. There are ample tables and chairs adjacent to the kiosk; perfect for larger groups or an intimate petite table for two! La Petite Crêperie, Westfield Knox Ozone is our first mobile outdoor takeaway caravan kiosk ( known as Juliette! ); currently located in the Ozone entertainment precinct. You will find a variety of sweet and savoury crêpes, sweet waffles, soft serve ice-cream and cold beverages. Crêpes and waffles are served with a variety of toppings including home made salted caramel, soft serve vanilla ice-cream, nutella, whipped cream and more. La Petite Crêperie, Hardware Lane was opened ten years ago and has recently closed ( January 2019 ). Please see our Locations section for more information. LPC Catering is provided by La Petite Crêperie. Please use the contact form below for any enquiries for that special corporate event or special festival! All batters and doughs are hand made daily; using simple, fresh ingredients. They are efficiently cooked on professional French crêpe hotplates and waffle irons. Most toppings are homemade or sourced from quality local providers. Located on the footpath on the corner of Little Collins and Swanston Street, our kiosk is Melbourne’s smallest yet most popular French take away delight! You will find sweet crêpes cooked right before you and served in take away cones. Favourite toppings include ‘lemon and sugar’, ‘nutella and almonds’, ‘real maple syrup’ and our famous homemade salted caramel (made with Sel de Guérande). We are open until late every night. Come and visit our newly opened French Vintage Caravan Kiosk: Lucile! She is permanently parked in the CBD’s well known QV Square with ample cover and seating. Here too you will find sweet crêpes cooked right before you and served in take away cones. You will also find our newly launched home made sweet waffles served with a range of our most popular toppings. This is the first location where you can build your own crêpe and waffle menus….so come and get creative! Some of the toppings include ‘nutella’, ‘ice cream ( waffles only ), ‘fresh strawberries and bananas’, home made salted caramel and more. We are open until late every night. Come and visit our first indoor kiosk: Violette, located in Melbourne’s newest entertainment precinct; The Loft ! Here you will find our most popular authentic toppings which you can combine to create your own sweet crêpe and waffle combinations. There is ample seating around the kiosk; for both large groups as well as more intimate tables for two. Our open style kiosk combines your favourite elements of our Swanston Street Kiosk and Vintage French Caravan style where you can watch and take part in the authentic French atmosphere. We are located adjacent to Hoyts Cinema and are open 7 days until late. Come and visit our takeaway kiosk: Juliette! She is currently parked in the Ozone entertainment precinct at Westfield Knox Shopping Centre. Here too you will find sweet crêpes cooked right before you and served in take away cones. In addition to these you will find our most popular savoury crêpes and home made sweet waffles with your favourite toppings including 'nutella, almonds and cream', 'home made salted caramel and vanilla ice-cream', and more. We are closed at this location from January 2019. We apologise for any inconvenience - please see link below ( bold ) for more information. We can still be found in the Melbourne CBD at two main kiosk locations; Swanston Street and QV Square; for more of your favourite sweet crêpes and waffles ( along with cold beverages including Orangina )! A bientôt. Please contact us for any catering or general enquiries below. Important updates & news can be found on our Facebook Page (La Petite Creperie Melbourne). Want to be part of our growing team? Interested in working with us? Send us a tailored cover letter and resumé..